When you are tired of that outdated white shower tile and your plumbing system is over ten years old and needs an update, you need to contact a bathroom remodeling contractor. In Tampa, it is important to keep the washroom up to date because technology is improving every year. This can make your entire home more efficient and smooth, reducing plumbing disasters and enhancing appearance. With the right services, your home can be the envy of all your family and friends! Choosing to go forward with a bathroom remodel is a big decision, but an even bigger decision you must make is who you hire to get the job done. You do not want to rely on “your neighbor’s friend’s cousin’s coworker’s sister’s friend” who is not licensed or experienced with the complexities of home modifications. When it comes to altering major systems like electrical and plumbing, there is no room for error. You need someone who has the experience and know-how to make sure the job is not only done right, but done well. License and Insurance. Is the business you are considering licensed and insured in the State of Florida? Experience. How many jobs have they worked on? Do they have hands-on training and the skill set to handle complex challenges that may arise? You do not want to have to hire another company after you finally get the project started. Customer Feedback. Read as many reviews and testimonials as you can. These honest opinions and insights of others in Tampa will help you determine whether the business you are investigating is a good fit for you and the project you want done. Galleries and Photos. Check the website of the bathroom remodeling contractor to view a gallery of past work. Not only is this a good way to determine their level of artisanship, but you can also get project inspiration and ideas. At Greaves Construction, we work hard to make sure that every client of ours is 100% satisfied with our work. We sit down with you before beginning a project to make sure we know exactly what you are envisioning for the end result. As a bathroom remodeling contractor in Tampa Bay, we have seen plenty of clients come to us after other services have given them lackluster results. Instead of wasting your time and money, come to us first, and we will make sure you get the design of your dreams. We specialize in custom designs in Tampa so you can get the exact setup you want. You will not have to worry about cookie cutter appearances with a little help from us! From unique glass mirrors and ornate shower entry designs, as a bathroom remodeling contractor, we can make sure your room is a special oasis designed with you in mind. We also work heavily in universal design, which is meant to ensure that buildings are accessible for all, no matter their condition. Whether you or a loved one is wheelchair-bound or you want to ensure that any elderly visitors are safe and secure in your home, we can fit handrails, wheel-in showers, lowered countertops, and so much more to make it convenient and safe for all. At Greaves Construction, we pride ourselves on providing superior customer service and support in Tampa. 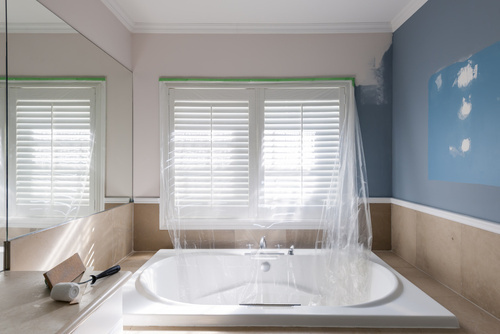 We want to be the first and last bathroom remodeling contractor you ever need to hire, and we strive to develop positive, lasting, and professional relationships with our clients. For your safety and the safety of our crew, we are fully licensed and insured. To learn more about Greaves Construction or to get started on your new home improvement project today, give us a call at 813-985-2739.